Tiger Woods fired his lowest 36-hole total in two years with a five-under 66 to put him in contention at the Quicken Loans National in Virginia. The former world number one's display followed an opening-round 68 to take him to eight under, three shots off the lead held by Japan's Ryo Ishikawa. England's Greg Owen is also on eight under along with seven other players. 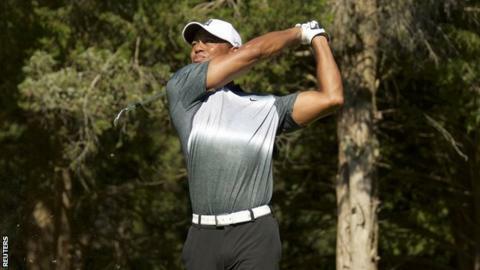 Woods, 39, is a 14-time major winner and has slipped to 266 in the world rankings. The American, who missed the cut at both the US Open and The Open, hit his lowest two-round total since the 2013 World Golf Championships-Bridgestone Invitational. "I'm in a good spot," he said. "I'm looking forward to the weekend. I'm looking forward to getting after it." On Friday, he only made one bogey and sunk six birdies at the Robert Trent Jones Golf Club in Gainesville, Virginia. Americans Rickie Fowler and Kevin Chappell are a shot behind Ishikawa, and the former believes Woods has turned a corner. "It's great to see him back on the front page of the leaderboard," Fowler said. "It sounds like he has started to feel better about his game and felt good out there. Hopefully he can get out there and get it going and we'll have some fun over the weekend."